"The exhibition and related events for COUM Transmissions proposes an unprecedented exploration of the private thinking and public actions of COUM Transmissions, a collective who first started to meet and experiment in Hull in the late 60s. "Comprising trace evidence of COUM Transmissions' activity up until 1976, when their self-elected cessation at the ICA exhibition Prostitution made way for Throbbing Gristle, the display of ephemera, drawn principally from the personal collections of Cosey Fanni Tutti and Genesis P-Orridge (the latter held at Tate Britain's Archive) endeavours to document an influential agency that compelled members to write, perform and generally agitate prevailing cultural forms. "Whatever other etymologies evolved subsequently, the term COUM Transmissions was, in its origin, a disembodied voice mystically received by Genesis P-Orridge whilst driving through Wales in 1969. This, at least anecdotally, set in motion the sounds and material actions of COUM Transmissions. Over its course COUM incorporated disparate personalities drawn to a desire for the contradictory and consensual expressions of banality, nihilism and notoriety through the mediums of ritual organisation and the readymade. "Utilising and subverting everyday materials and objects, COUM Transmissions set out to eviscerate normative cultural behaviour. Operating in the slippage between music, theatre, street performance, burlesque and bureaucracy, COUM objectified subconscious states, frequently through abject means. 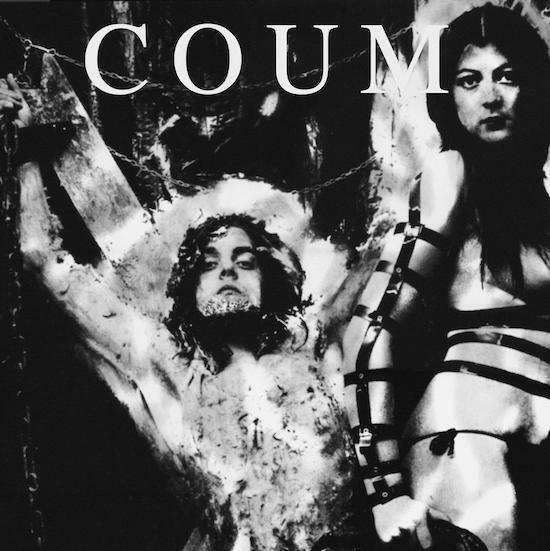 "By means of chance and choreographed ceremonial purpose, COUM Transmissions introduced an unfamiliar language of often awkward, surreal and sexualised acts into social arenas throughout the UK, Europe and latterly the USA. "On each occasion, COUM's auditory and kinetic actions constituted spontaneous responses to collective and individual experience. Simulation and artifice combined with actual and real, confounded familiar systems, methods and institutions, re-activating the spaces of the street, lecture theatre or art gallery. "COUM's reflective procedure also entailed the objectification of their own activities through written analysis and communiqués. These dispatches became the accretions of COUM's corporeal body and are central to the display. "Coloured photographs documenting the formative 60's performances in Hull, personal letters, hand-written notes and scripts, cheap flyers, ink sketches, typed manifestos and film footage provide core ingredients of the display. In this way the voices and material contributions by key protagonists Spydeee, Foxtrot Echo, Fizzy Paet, Biggles and The Very Rev. L. E Cheesewire Maull are introduced. "This ephemera is also contextualised by correspondence COUM had with other 70s fluxus groups and individual artists around the world. These transmissions were vital to COUM's singular, semantic and satirical writings, defining through energetic wordplay its own characteristic entity. When studied closely, many of these written provocations generated from Genesis's typewriter, also carry the embryonic conceptual substance of eventual live performances. "COUM Transmissions extemporised an exploratory approach to language in its provocative, altered, and at times hallucinogenic communications. This exhibition liberates COUM Transmissions from what has, up until now, been predominantly an anecdotal, legendary account. "The presentation of objects, written matter and performance reliquary; a wealth of flotsam, marshalled at the Humber Street Gallery for the first time, will recover and reanimate this seminal phenomenon which has informed the legacy of live and interdisciplinary art practice since. "Conceived by Cosey Fanni Tutti, funded by Hull 2017 shot and edited by Gavin Toomey, seven filmed interviews with original COUM members are presented on the second floor. "Periodic commentary and factual information is provided by way of didactic captions. "This selective, historical survey is attended by two panel discussions on Saturday 4th February. The first, moderated by Luke Turner of the Quietus brings together five original members of COUM Transmissions: Cosey Fanni Tutti, Genesis P-Orridge, 'Spydeee Gasmantell', aka Ian Evetts, Greg 'Foxtrot Echo' Taylor and John Lacey. The second, convened for more expansive readings of COUM Transmissions, comprises Ghislane Leung, writer and artist; Paul Buck, writer and editor; Dan Fox, editor of Frieze and Anne Hilde Neset, writer and ex-editor of the Wire."